Could you use a lomi-lomi massage, therapy in a warm pool, or perhaps sea- water cleansing to get rid of toxins in your body? How about a little ho’oponopono that comes from the heart to clear your psyche? Two hundred yeas ago when disapproving missionaries arrived, Hawaiians took their beliefs underground. But in the 1970s, native Hawaiian healers dared to bring their ancestral knowledge back into the light of day. 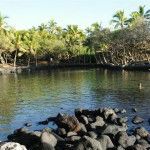 The intensity of the elements of earth, fire, water and wind has made Big Island a magnet for healers of all persuasions. Their special knowledge is easily accessed if you know where to look. Kalani Ocean Retreat, hidden in the tropical Puna district, is a good place to start. 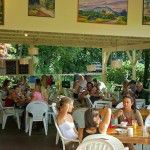 The retreat has nurtured creativity in a caring, communal environment for thirty years. I arrived fatigued with a bad case of burn-out. Sylvie, my provider at Kalani, massaged my spine while I floated face up in the Watsu water therapy pool. When she hugged me to her body in a maternal embrace, I felt acceptance that allowed me to forgive and forget whatever it was that was troubling me. Then she led me to a lanai framed in pink bougainvillea where I received lomi-lomi, or the loving touch. Lomi-lomi is more than massage. When given properly it is made more powerful with prayer to the ancestors asking forgiveness of painful memories held in the body. Hawaiians believe that mana, or spiritual energy, is handed down and intensified from one generation to the next. A genuine Hawaiian master will not just use hands, forearms, and elbows in long gliding strokes to release tension from muscles, but will use mental intention to redirect the patient’s stressful thoughts. 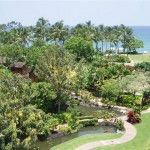 Hale Makamae (Moana), a bed and breakfast sequestered on two lush acres of manicured gardens, makes a good home base for explorations in Eastern Hawaii that includes the Puna District. 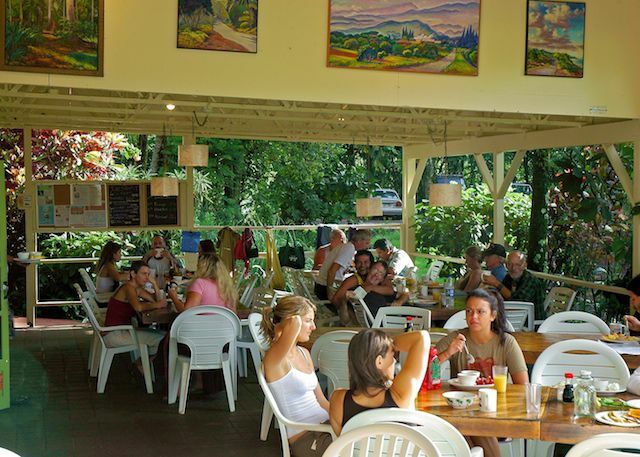 Yoga in this tranquil setting is a great way to plug into the power of the Big Island. It is a young island still being formed by Pele, the impetuous goddess of the volcano and is believed to be a vortex of immense energy. Within minutes you are at night viewing station of the lava flowing down the flank of Kileaua, the most active volcano in the world, spilling into the sea creating billowing clouds of steam. From there the undulating coastal road takes you to beach parks sporting hot and cold pools. Aunty Mahealani Henry is a beautiful example of the Hawaiian matriarch filled with great aloha. She takes those in need of her healing powers to Ahalanui Hot Pond in Puna where the waters are heated by Pele. 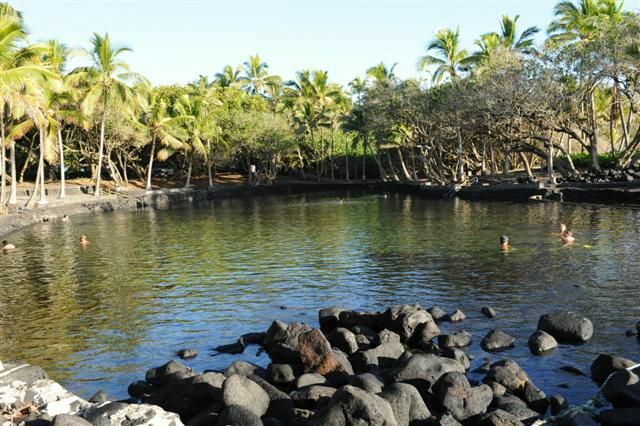 While floating in the mineral rich waters, she practices ho’oponopono, the ancient Hawaiian version of mediation. The leader of a session must come with a clear heart and cleansed mind. The participants must come with an attitude of forgiveness and acceptance. She helps people talk things out in a way that allows them empty their bowl of negative emotions bringing them back to aloha lokahi a state of unity and unconditional love. Kumu Dane Silva uses the holistic triad of lomi-lomi, laau lapaau (medicines from native plants) and ho’oponopono to help people rebalance their energies. He employs the ingestion of diluted seawater, the universal Hawaiian remedy to loosen the bowels and rid the body of toxins. He also relies heavily on the implicit power of place. We met in Hilo on Coconut Island, also known as the healing island. The ancients chose this place because it has great spiritual energy. People who come to him are out of harmony with their physical, emotional and/or spiritual bodies. While giving nature walks and tours of places with healing power Dane Silva attempts to diagnose the source of their problems and to determine the best modality for their specific treatment. 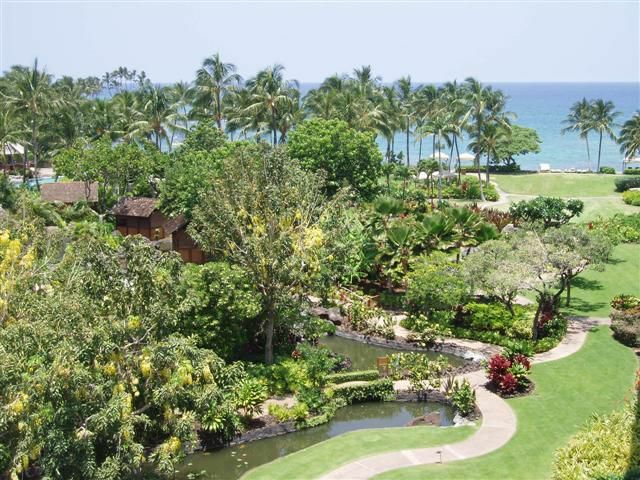 The Fairmont Orchid is an oasis of tropical abundance on the sunny Gold Coast of Kohala. A stunning shoreline stroll takes you to fishponds still in use that were built by the Hawaiians 1,000 years ago. It is also home to the “Spa without Walls” where pampering knows no bounds. Lomi-lomi massage in this potent power place in the open air by the sea seemed a fitting finale to my healing holiday. While being slathered with sandlewood oil, I listened to the lap of waves and sway of the palms in a teasing breeze. I thought about what Dane Silva said about opening yourself to receive mana from the elements, and Aunty M’s words about forgiveness. After my massage my muscles felt pliable, my joints loose, and my heart open. I hoped that if I applied the lessons learned from the people of old, I could stay this way forever.